Collection donated by Wm. D. Schrack, III in March 2013 (Accession Number 2013: 017). The Collection is organized into two groups, Photographs and Artifacts. William D. Schrack was a student athelete at the University of Pennsylvania in the Class of 1896. He was born in Germantown, PA and attended the Franklin School before entering Penn. While at Penn he was a member of the University’s first basket ball team, as well as lettering in track, football, and baseball. After graduation Schrack entered Penn’s Medical School, graduating in 1900. He practiced medicine in Phoenixville, and was the frist resident physician at the Phoenixville Hospital when it opened in 1900. Dr. William D. Schrack died on June 6, 1960. 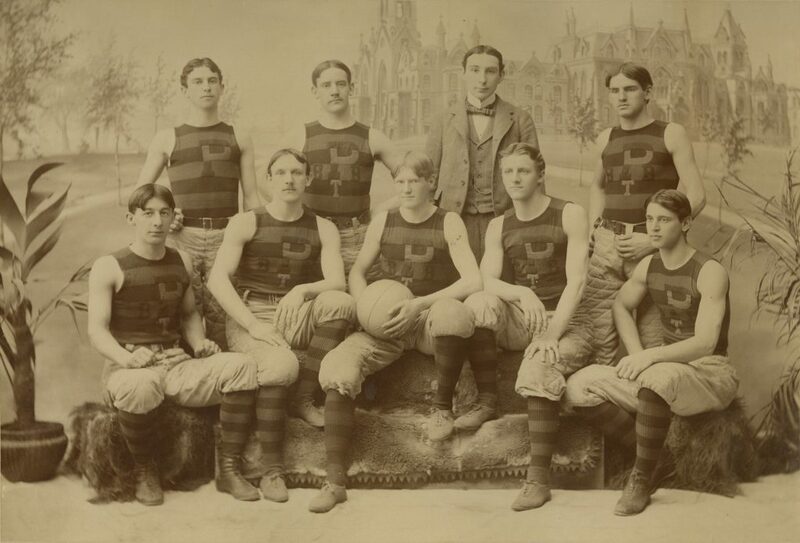 The William D. Schrack Memorabilia Collection contains items related to Schracks time as a student athelete at the University of Pennsylvania in the mid-1890s. Included are two team photographs, a jersey, a trophy and a luncheon plate from Houston Hall. Basketball Team (Schrack far right front row), n.d. n.d.
Houston Club Luncheon Plate n.d.